Baton Rouge, LA – Grant writing, establishing a 501(c) 3 non-profit organization, growing an established business, developing a small business strategic plan, succession planning, making decisions based on financial statements, information on lending-wills and the requirements to become a licensed contractor are some of the topics that will be discussed during the Center for Rural and Small Business Development at the SU Ag Center’s 12th annual Connecting Businesses with Contracts Procurement Conference. 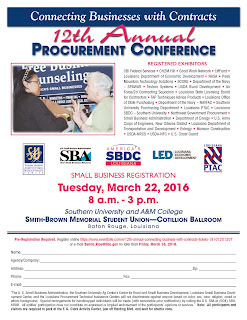 The conference will kick off with a business to business networking session at 5:30 p.m. on Monday, March 21 in the LaCumba Play Den of the Smith-Brown Memorial Union on the Southern University Baton Rouge campus. The actual conference will begin at 8 a.m. on March 22 in the Smith-Brown Memorial Union. 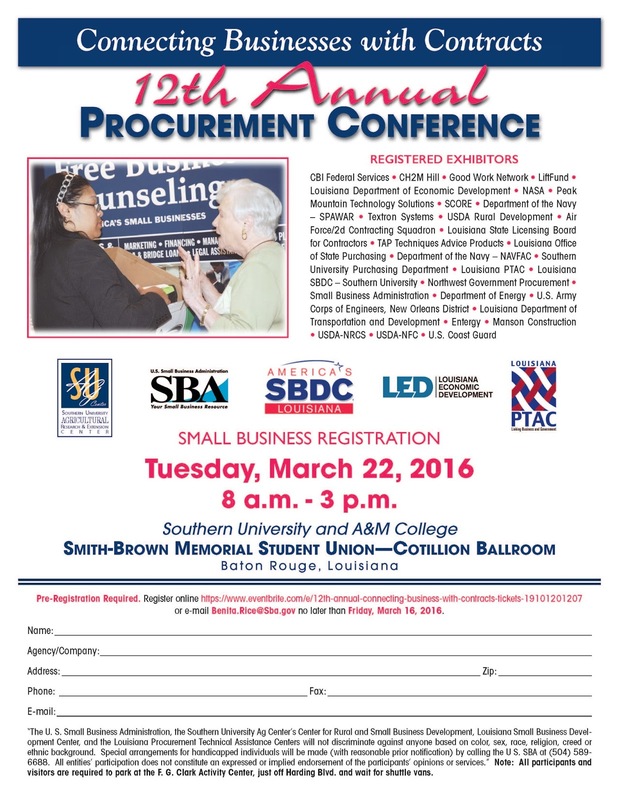 This event is co-sponsored by the U. S. Small Business Administration; Louisiana Small Business Development Center at Southern University; Louisiana Economic Development (LED) and Louisiana Procurement Technical Assistance Center (PTAC). The conference is free, but pre-registration is required. Small businesses are welcome to exhibit their products and services during the conference, but they must pre-register. To register for the networking session, as a conference participant or as an exhibitor, visit http://www.crsbd.com/events/. 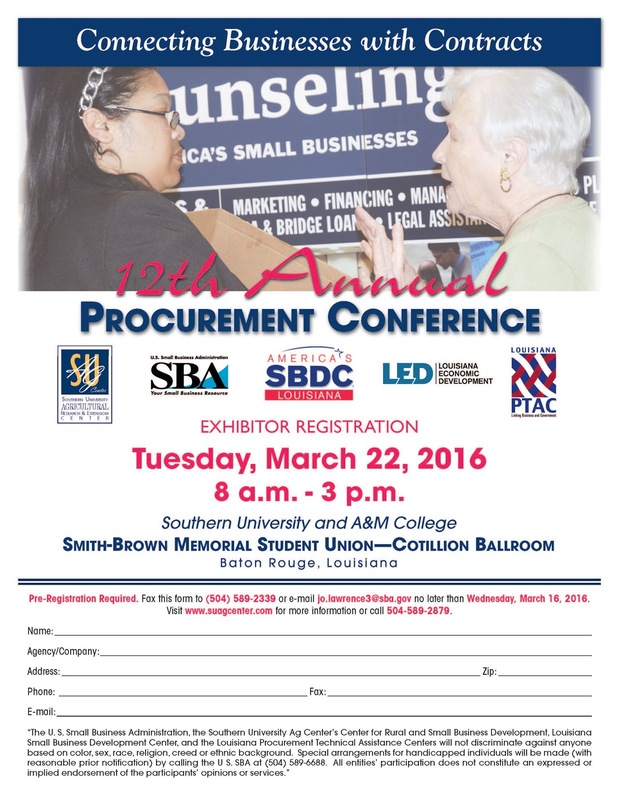 Exhibitors can also register by faxing a registration form to (504) 589-2339 or by e-mailing the form to jo.lawrence3@sba.gov no later than Wednesday, March 16, 2016. On-site participant registration will be available on the day of the conference. 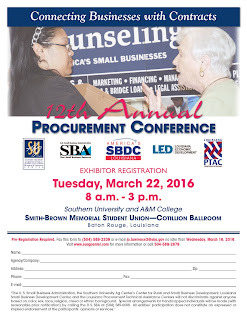 For more information about the Procurement Conference or to obtain registration forms, contact Gloria London at (225) 771-4107, e-mail gloria_london@suagcenter.com or Eual Hall at (225) 771-4105, e-mail eual_hall@suagcenter.com. 1st place - SUNO Team with coaches and event organizer. L-r: Samuel Okpechi, Nathan Albert, Coach Amelia B. 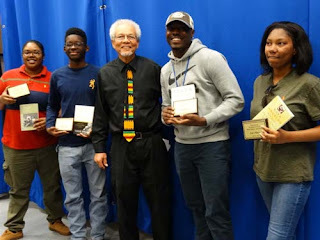 Sellers, Dr. Owusu Bandele, Joshua Leavell, Nathaniel Albert, Chante Galman, and Asst. Coach Shrylin Davis. Baton Rouge, La. - The Southern University Ag Center and Division of Agricultural, Family and Consumer Sciences successfully completed the 22nd Annual Black History Quiz Bowl on Thursday, February 25, 2016. 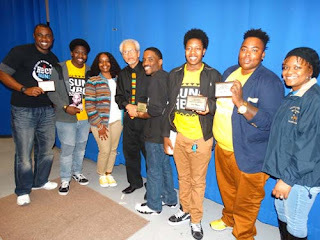 This year, the team from Southern University in New Orleans (SUNO) came in first place. The Minorities in Agriculture, Natural Resources and Related Sciences (MANRRS) Aggies team took second place, and the Urban Forestry team finished in 3rd place. The top teams took home plaques while each contestant had a choice of a book from the Black History collection. Each team consisted of four players, one of whom served as captain. Questions included a wide variety of topics from academia to sports, books, current and past events and much more. The Bowl, under the leadership of Owusu Bandele, Professor Emeritus in Horticulture, is open to all SU campuses and even area high schools. Dr. Bandele said he appreciates the development offered students in preparing, organizing teams and being inspired by knowledge of our heritage. 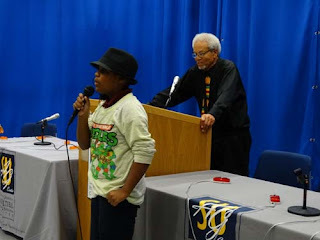 For the second year in a row, the highlight of this year’s competition was a rendition of Langston Hughes’ “Ballad of the Land Lord” by 11-year old Kahlila Bandele, who attends Brownfields Elementary in Baton Rouge. 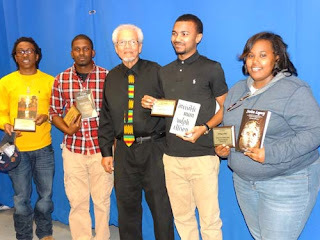 Plaques were awarded to 1st, 2nd and 3rd place winning teams, and all participants received a book by or about some aspect of the Black experience. Dr. Bandele appreciates the development offered students in preparing, organizing teams and being inspired by knowledge of our heritage. Southern University Ag Center agents and staff will hold celebrations in the classrooms of selected schools in East Baton Rouge (including schools in both Baker and Zachary) St. Helena, Orleans, Tangipahoa and Madison Parishes. These celebrations will include activities on composting and/or recycling. The Ag Center is also hosting a photo contest as part of the 2016 celebration. Any student currently enrolled in a K - 12 school within the State of Louisiana is eligible to participate in the contest. To enter, students must submit a photo that expresses what being a “Steward of a Healthy Planet” means on Facebook by tagging the Southern University Agricultural Research and Extension Center or on Instagram by tagging the SU Ag Center at @su_agcenter. Students must also use the hashtag #SUAgDayContest16 and include their school’s division (either elementary, middle or high school) with their entry. Prizes will be awarded to one student in each division and to the student who receives the highest number of “likes” on social media. For the official contest rules, visit www.suagcenter.com and click on the National Ag Day banner. National Ag Day marks a nationwide effort to tell the true story of American agriculture and remind citizens that agriculture is a part of all of us. The day is organized by the Agriculture Council of America (ACA), a nonprofit organization comprised of leaders in the agricultural, food and fiber community, dedicating its efforts to increasing the public’s awareness of agriculture’s role in modern society. For additional information about the Southern University Ag Center’s National Ag Day activities, contact Dr. Renita Marshall at 225.771.2242. 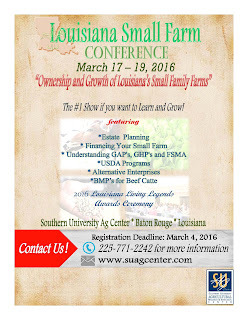 Baton Rouge, LA- Small farmers from throughout the state will gather at the Southern University Agricultural Research and Extension Center March 17-19 to attend the 6th annual Louisiana Small Farmer Conference. The three-day conference, themed “Ownership and Growth of Louisiana’s Small Family Farms,” is designed to educate, provide expanded awareness of educational opportunities, USDA programs and services and other resources to help small farmers stay in business. 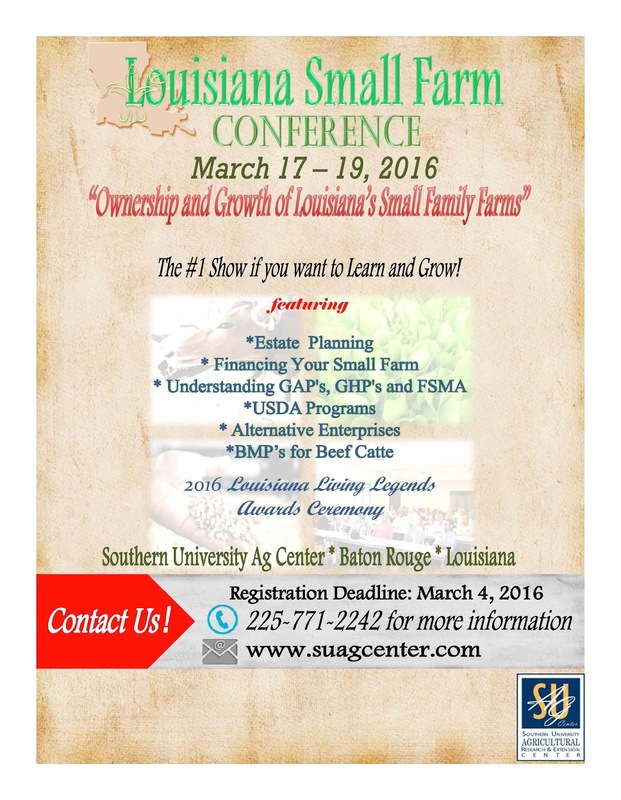 The conference, which kicks off at 10 a.m., will include a risk management and networking session; a panel discussion with USDA agencies; the Louisiana Living Legends Banquet, which honors individuals who have made significant contributions to Southern University in the areas of Agriculture, Family and Consumer Sciences, and will end with the first session of the 2016 class of the Louisiana Small Farmer Agricultural Leadership Institute. Registration for the conference is complimentary for anyone who submits their registration form by March 4. On-site registration will begin at 8 a.m. daily during the conference. To register, visit http://www.suagcenter.com/small-farmers or contact Dr. Dawn Mellion-Patin at 225-771-2242 or via e-mail at dawn_mellion@suagcenter.com. Baton Rouge, La - Commodity Classic "Jazzed" to Welcome Agriculture Secretary. U.S. Secretary of Agriculture Tom Vilsack will make his seventh visit to Commodity Classic, the nation's largest farmer-led, farmer-focused convention and trade show. Secretary Vilsack will deliver a keynote address to several thousand farmers and Ag allies during the event's General Session, to be held Friday, March 4, 2016 in New Orleans. "Secretary Vilsack continues to be a strong voice for farmers and ranchers, and we are jazzed to welcome him back to Commodity Classic," said National Corn Growers Association President Chip Bowling. "Secretary Vilsack brings a thoughtful perspective on the top policy issues affecting the Ag industry. We are especially eager to hear from him about the new Trans-Pacific Partnership agreement and how that will impact farmers, ranchers, and the rural economy." "Biobased products pump $369 billion into the U.S. economy each year and support 4 million jobs, directly and indirectly, in rural and small towns across the United States. At the same time, biobased products help us reduce our consumption of petroleum by focusing instead on renewable resources. Everything from plastics and packaging, to cross-laminated timber for residential and commercial building, to textiles, are part of today's biobased economy, benefitting farmers, ranchers, producers and working families in America's rural communities. I applaud Procter & Gamble for integrating renewable materials into Tide detergent, a classic, everyday American product that now carries the USDA Certified Biobased label. American families want to invest their hard-earned dollars in products that are good for them, the environment and our economy, and that's why USDA's BioPreferred program has continued to grow by leaps and bounds, with a catalog of more than 2,500 biobased products today. The USDA Certified Biobased label and USDA's BioPreferred program help consumers make informed decisions about their purchases, giving them assurances that their product was made using renewable materials, such as plants or forestry materials. Procter & Gamble's commitment to these standards is encouraging for the growing biobased sector, and we anticipate greater interest in the BioPreferred program as a result." To learn more about USDA's BioPreferred Program and what it means to be certified biobased, read our fact sheet or visit www.biopreferred.gov. Baton Rouge, LA – More than 100 budding farmers from throughout Louisiana will gather at the Maurice A. Edmond Livestock Arena in Baton Rouge for the Southern University Agricultural Research & Extension Center’s 73rd Annual State Livestock & Poultry Show on March 3-5, 2016. The youth are expected to bring over 200 head of prize worthy beef and dairy cattle, hogs, sheep, lamb and goats to compete for the title of state champion in their categories. These animals have been showcased or have won a parish competition before competing at this event. Animals will begin weighting in at 11 a.m. on March 3. Judging for the beef and dairy cattle will begin at 6:30 p.m. that evening. All other animals will be judged on March 4. Besides animals being judged for competition, this year’s livestock show will feature a petting zoo, guided tours for school groups, face painting, and the Hall of Louisiana Agriculture. Exhibiting youth will also participate in an ‘old fashion livestock decorating contest’ with their animals during the “Night with the Stars,” event. This event will be held two hours after all shows are completed on March 4. An awards presentation for youth of champion market animals will be held Saturday, March 5 at 8:30 a.m. and a Junior Auction Sale will begin at 9:30 a.m. Meat buyers are encouraged to come to the auction to bid on the show’s meat. All proceeds from the meat purchases go directly to the exhibiting youth. This ensures that the youth are rewarded for their investments, hard work and dedication. The annual Southern University Livestock Show provides a venue for youth to display what they have learned in raising and caring for livestock. Youth involved in livestock shows and agriculture related events learn responsibility, leadership and management that will help them become productive citizens of Louisiana. For further information, visit http://www.suagcenter.com/livestock-programs or contact Curtis Chisley at curtis_chisley@suagcenter.com or 225.771.5882. More information on risk management tools available for organic farmers can be found on the RMA organic crops website. Visit www.usda.gov/organic to learn more about USDA's resources for organic agriculture. Photo of the Kentwood High Magnet School's OMG Club 'Dress for Success' Enrichment Series participants. Kentwood, LA – On Wednesday, February 17 you could find members of the Kentwood High Magnet School's Outstanding Mature Girlz (OMG) Club dressed in their ‘Professional Best.’ Nearly 20 young ladies opted to get out of their normal routine of wearing their school uniforms to participate in the SU Ag Center’s “Dress for Success” Enrichment Series. This series opened the dialogue for SU Ag Center’s Assistant Area Agent, Nicolette Gordon to answer the many questions young ladies had about dressing for a potential job interview, and making their first impression their best impression. In a time period where fashion trends are constantly changing, Gordon modeled shoes, accessories, and even demonstrated how to spray a subtle amount of perfume on for an interview. She stressed the importance of keeping their appearance simple, and letting their skillsets be the driving force during any interview. They also discussed the difference between ‘business professional’ and ‘business casual’ dress, and professionalism versus being an amateur. At the conclusion of the enrichment series, OMG Club members practiced walking in their high heels, and anxiously waited to be professionally photographed. As a result of participating in the “Dress for Success” series, club members will receive a professional headshot that will be later used for creating mock non-traditional resumes. OMG Club member Teanna Lee hands Mr. Jessie a rose during Love Fest 2016 on Feb. 13 under the Trevor J. Sims Memorial Bridge. St. Helena College & Career Academy OMG Club President Kyla Bryant hands a to-go plate to a Love Fest 2016 attendee on Feb. 13 under the Trevor J. Sims Memorial Bridge. The event was held in an effort to bring the community together in a fun way that also directed individuals to housing and medical resources. Baton Rouge, LA – On Saturday, February 13th love was in the air as the SU Ag Center’s Outstanding Mature Girlz (OMG) Club helped to serve nearly 300 homeless individuals under the Trevor J. Sims Memorial Bridge. The young ladies traveled from St. Helena Parish to participate in Love Fest 2016 as part of the OMG Club’s monthly Community Service Initiative. The club’s members helped fill bags with toiletry items and handed them out, as well as worked the food assembly line during the event. OMG Club Members, Alberta Paterson and Shanika Holmes of St. Helena College & Career Academy managed the clothing donation area, as members in the community continuously dropped off large bags filled with slightly worn or new clothes. Love Fest 2016 was organized by the community organization Live Love Serve. Its founder Dana Buckley held the event as a way to point people to housing and medical resources. “Although homelessness is a very serious matter in the Baton Rouge Metropolitan area, the event was also created to be fun, and bring the community together,” said Buckley. This was evident as some of the OMG Girlz led a line dance with some of the attendees. They also handed out handmade valentine cards, roses, and heart shaped cookies as another way to show how much they care. An article on the event appeared in The Advocate Newspaper on Feb. 13. The article can be viewed by visiting, http://goo.gl/ffxLk2. For more information on partnering to enhance the OMG Club’s Community Service Initiatives, contact Nicolette Gordon in the Tangipahoa Parish Extension Office at 985.748.9381, or in the St. Helena Parish Extension Office at 225.222.4136. Baton Rouge, La. 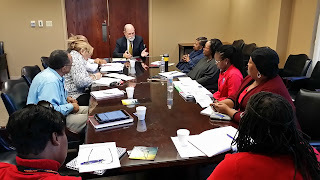 – The Southern University Ag Center has partnered with the Lafayette Parish School System’s (LPSS) Adult Education Program and the Louisiana Community and Technical College System to provide free Financial Literacy Classes for the community. 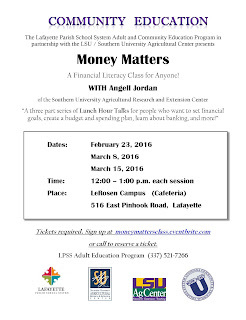 The three part Lunch Hour Talks series, named ‘Money Matters: A Financial Literacy Class for Anyone!,” will be held from 12 p.m. – 1 p.m. on Feb. 23, March 8, and March 15 in the Cafeteria Meeting Area at the LPSS LeRosen Campus, 516 East Pinhook Road in Lafayette, La. 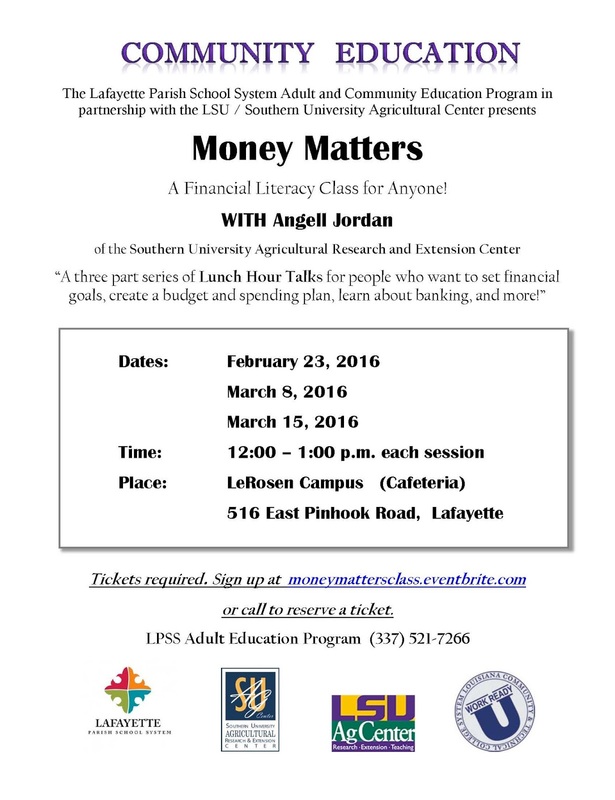 Angell Jordan, SU Ag Center Assistant Area Agent for Acadia and Lafayette Parishes, will teach participants how to set financial goals, create a budget and spending plan, banking and much more. Tickets are required to attend and can be obtained by visiting moneymattersclass.eventbrite.com or by calling the LPSS Adult Education Program at 337.521.7266. Job shadow day participant Robert Jackson stands outside the St. Helena Parish Extension Office on Feb. 2, 2016. Robert learns how to make a smoothie on the 'Smoothie Bike,' at the St. Helena Parish Extension Office. Baton Rouge, La. – ‘Job Shadow Day’ is a full-day event to help middle school students gain exposure to the various careers that this world has to offer. On Tuesday, February 2, 2016, Nicolette Gordon, Southern University Ag Center Assistant Area Agent, introduced Robert Jackson, a sixth grader at Westside Jr. High School, to the wonderful world of careers in Cooperative Extension. Gordon provided a first-hand look at the personal skillset, knowledge and education Jackson would need in order to pursue a career in this field. Although this event is designed to partner youth with careers of interest, it is also used to gain exposure to those careers that are not necessarily familiar to them. Jackson’s day started off in the office, and making a mail run. While dropping a letter in the postal box, he was greeted by a prominent member in the Greensburg community. “This is where he learned his first lesson about Cooperative Extension,” said Gordon. She quickly reminded him that being an area agent is solely dependent upon building good relationships within the community. Gordon also gave him a tour of the St. Helena 4-H Goat Farm to see the Boer & Norwegian Goats that will be shown during the SU Ag Center’s 73rd Annual State Livestock Show in March. Opelousas, LA – The Southwest Center for Rural Initiatives (1209 Diesi St., Opelousas, LA 70570) is set to begin an exercise accountability program “Commit to Being Fit and Healthy” on March 14, 2016. Research has shown that individuals who are participating in group fitness tend to stay committed and active longer than individuals who attempt to start alone. Commit to Being Fit and Healthy is a holistic wellness program and will include both exercising and eating healthy. 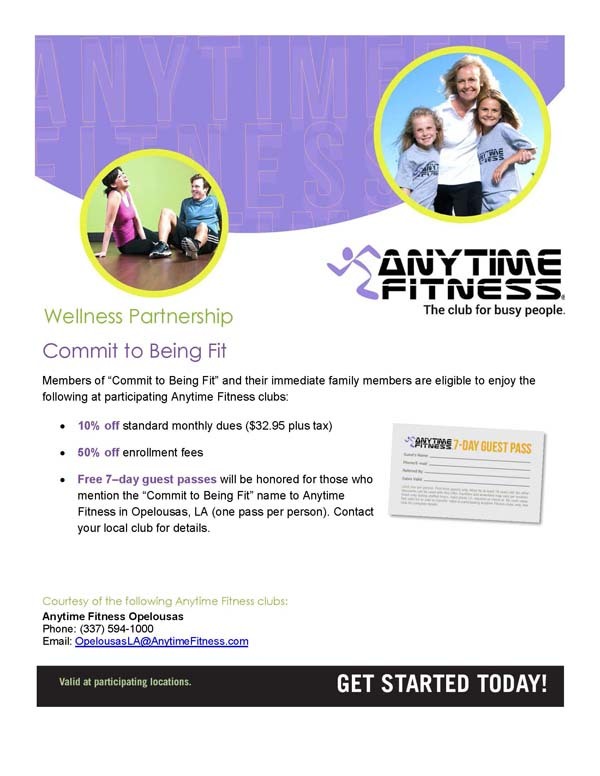 In addition to this once-weekly program, “Anytime Fitness” of Opelousas has volunteered to become a wellness partner and offer participants and their families discounted membership, registration fees, and free guest passes. 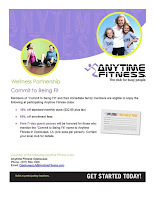 “Upon meeting with Seth (Anytime Fitness, owner), he was so excited to be given the opportunity to give back to the community; we agreed that overall wellness is a vital part to living a healthy lifestyle”, said Krystle Washington. “When I first began to develop this program, my major goal was to locate a gym that would partner with me and help accomplish the Southwest Center’s goal of decreasing obesity in adults and youth by increasing physical activity and improving lifestyle choices; I hope the entire community comes out and takes control of their health,” said Washington. The Southwest Center for Rural Initiatives is a satellite arm of the Southern University Ag Center, located in Opelousas to serve a ten-parish region of Southwest Louisiana. Steven Turner, Director of the Southern Rural Development Center, (seated in the center) discusses Rural and Economic Development collaboration opportunities with SU Ag Center administrations, researchers and specialist during a Feb. 5 meeting at the Ag Center. Baton Rouge, La. – Southern University Ag Center researchers, specialists and administrators held a meeting with Steven C. Turner, Director of the Southern Rural Development Center (SRDC), on Feb. 5 at the SU Ag Center. The meeting was held to discuss possible Rural and Economic Development collaborations between the SU Ag Center and the SRDC. Turner, who previously served as head of the Mississippi State University (MSU) Department of Agricultural Economics, officially became the director of the SRDC on Jan. 1. The SRDC, which is housed on the MSU campus in Starkville, Mississippi, is one of four regional centers coordinating rural development research and Extension education programs with land-grant institutions on both the regional and national level. The SU Ag Center will continue to partner with the SRDC and other rural development organizations in an effort to strengthen the rural communities of Louisiana. 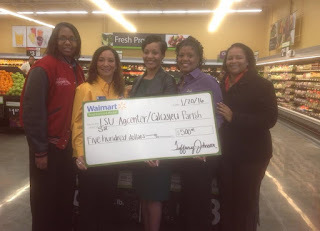 Standing from left are, SU Ag Center Extension Specialist De'Shoin York, SU Ag Center Nutrition Agent Carol Sensley, Walmart Store Manager Tiffany Johnson, LSU AgCenter Nutrition Agent Shatonia McCarty and LSU AgCenter EFNEP Manager Sharman Charles. From left, LSU AgCenter's Shatonia McCarty, Southern University Board Member Raymond Fondel and SU Ag Center's Carol Sensley pose for a photo during the grand opening of a Lake Charles Walmart Neighborhood Store on January 20, 2016. Baton Rouge, La. – Calcasieu Parish Nutrition agents with the Southern University and LSU Ag Centers were presented with a Walmart Community Health and Wellness Initiative grant by the Walmart Foundation during the grand opening of a Lake Charles Walmart Neighborhood Store on January 20. The award, which will be used to provide support to community outreach through the promotion of health and wellness among Lake Charles residents, was presented to Southern University Ag Center’s Carol Sensley and LSU AgCenter’s Shatonia McCarty for their work with the Creating, Healthy, Enjoyable Foods (C.H.E.F.) Cooking Camps. Sensley, McCarty and several C.H.E.F. Camp participants provided food demonstrations and samples for the store’s customers during the event. 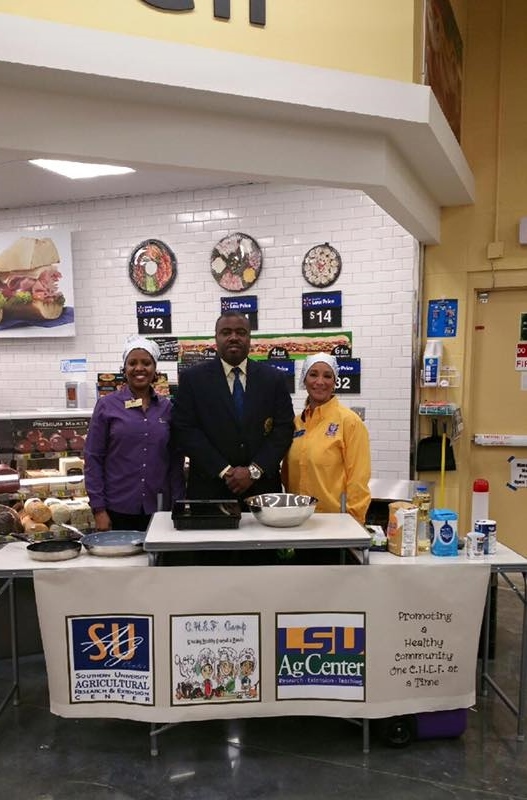 SU Ag Center Extension Specialist De’Shoin York along with LSU Ag Center’s Expanded Food and Nutrition Education Program (EFNEP) Manager Sharman Charles were present to support the efforts of the agents. SU Board of Supervisors member Raymond Fondel, Police Juror and City Administrator Elijah Guillory and retired SU Extension agent Donna Jones also stopped by and sampled the food prepared during the demonstration. For additional information about the C.H.E.F. Cooking Camps, contact De’Shoin York at 225.771.2242. Baton Rouge, La - The Southern University Ag Center will Host its 22nd Annual Black History Quiz Bowl in the SU Ag Center auditorium on Feb. 25th at 3:00 pm. All students are eligible to participate. Teams (4 members each) must register by submitting a roster to obandele@cox.net by Friday, February 19. The roster may also include an alternate member. Rules and study guide are available. For rules, follow this link - http://bit.ly/1T0aMDm, and for study guide, click here - http://bit.ly/1S2USIe. 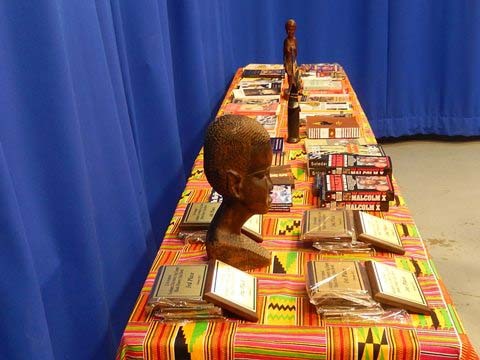 Plaques will be awarded to 1st, 2nd and 3rd place teams, and all participants will receive a book by or about some aspect of the Black experience. This event is organized by Owusu Bandele, Professor Emeritus. He can be reached at 225-284-0063 or obandele@cox.net for further information.